"Hope High School in Providence, Rhode Island was once a model city school, graduating a wide range of students from different backgrounds. But the tumult of the 1960s and the drug wars of the 70s changed both Providence and Hope. Today, the aging school is primarily Hispanic and African-American, with kids traveling for miles by bus and foot each day. Hope was known for its state championship basketball teams in the 1960s, but its 2012 team is much different. Disobedient, distracted, and overwhelmed by family troubles, with mismatched sneakers and a penchant for profanity and anger, these boys represent Coach Dave Nyblom's dream of a championship, however unlikely that might seem. Nyblom's mostly black players, including several who emigrated to Providence from war-torn Liberia, face gang violence, domestic uncertainty, drug problems, and a host of other issues. 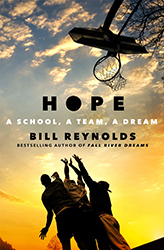 But with the unfailing support and guidance of Nyblom and other Hope coaches, their ragtag team gradually pulls together, overcoming every obstacle to find the faith and trust in themselves that Nyblom never stops teaching.